This weekend the final leg of the Sydney Triple Crown rolls around in the form of the Australian Derby, Australia’s richest race for three-year-olds, which offers $2 million in prize money and attracts all of the best horses and trainers in the category each year. This time out, it looks to be a race to beat Criterion, who has galloped into the week preceding the event in great form and holds all the cards to be the one that everyone will want to beat on the big day. The best place to have a bet on the 2014 ATC Australian Derby is with Bet365.com. The odds below were taken from the site, and you will be able to find the latest race odds there as well. Bet365.com is also offering each-way betting on the race, with which you will receive 1/4 if should your selection place in positions one to three. Criterion’s chances to claiming his second career Group 1 victory received a boost on Tuesday morning at the barrier draw, where it emerged that the David Payne-trained horse would start the race from the inside gate, where he will look to join Innocent King (1993), Universal Prince (2001) and Don Eduardo (2002) as the fourth horse in the history of the race to have won from the first barrier. The New Zealander, who will be ridden by Hugh Bowman on Saturday, gained a lot of the interest currently being shown in him for the race courtesy of his win in the Rosehill Guineas by three and a half lengths in his last start, and he will probably once again enjoy another wet track in Sydney. One of his main opponent’s for Saturday’s race will be fellow trans-Tasman runner Puccini. He finished in a disappointing twelfth in the very same Rosehill Guineas that Criterion won, though it was later reported that his jockey’s saddle had slipped, causing him to lose ground in the second half of the race after having been near the front of the race in the opening stages. Puccini had been the favourite going into that race, on the strength of his Group 1 New Zealand Derby win, and trainer Peter McKay was hoping for fairer weather for this Saturday’s feature. As mentioned above, the best racebook to place a bet on the 2014 ATC Australian Derby is Bet365.com, who will offer the best odds on the race. When visiting Bet365.com, click on ‘Horse Racing’ in the left sidebar and scroll down to the Antepost section of the page, where you will find the markets for this race and many more. The ATC Australian Derby is a Group 1 race for three-year-olds and is run over a distance of 2,400 metres at Randwick in New South Wales. 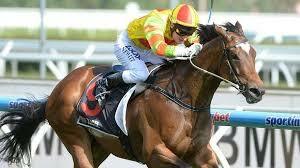 The race offers $2 million in prize money and was won by It’s A Dundeel in 2013.